Down Syndrome Daily: Primer: How Will The Election Change Medicaid? The future of Medicaid -- the state-federal workhorse of the nation's health system that provides health coverage to the poorest and sickest Americans -- hangs in the balance on Election Day. President Barack Obama and Republican nominee Mitt Romney have vastly different approaches to the program. Medicaid is the backbone of the 2010 health law -- considered Obama's signature legislative achievement -- which, starting in 2014, expands coverage to 30 million uninsured Americans. As many as 17 million of those newly insured citizens will be on Medicaid. Romney would turn over much control of the program to states and give them new powers to tailor benefits and eligibility to their own budget needs. Romney says such a move would begin saving $100 billion per year by 2016. The following list of "frequently asked questions" provides more details on the presidential candidates' plans for Medicaid. Tune in to the PBS NewsHour on Monday evening for Hari Sreenivasan's full report on the role Medicaid plays in the U.S. health care system -- especially for seniors living in nursing care facilities -- and how the proposals outlined by the candidates could impact the program. 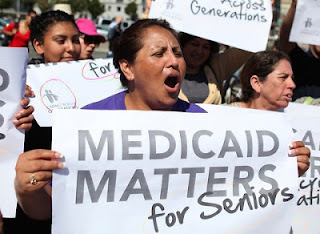 Created in 1965, Medicaid is jointly financed by the federal government and the states. States administer the program but the federal government sets minimum income and eligibility thresholds, targeting low-income children and their parents, the elderly and people with disabilities. It also sets minimum benefits that state Medicaid plans must provide. States can build on these requirements and, as a result, eligibility rules vary widely. The program now covers about 60 million Americans, of which about half are children. Medicaid pays for nearly two-thirds of nursing home residents and about 40 percent of births. Medicaid is an open-ended entitlement program in which the federal government matches state spending on health insurance. Match rates range from 50 percent to 73 percent, depending on a state's per capita income, with poorer states receiving higher rates. The average federal match is 57 percent. How does President Obama's health care reform law change Medicaid? The 2010 law eliminates varying eligibility rules and, starting in 2014, provides Medicaid coverage to everyone with incomes less than 133 percent of the federal poverty level, which today is nearly $31,000 for a family of three. This expansion could add as many as 17 million people to Medicaid over the next decade if all states adopt the change. Most of the newly eligible would be adults without children who currently are not covered in most states. The Supreme Court ruling which upheld the health care reform law made this expansion optional for states. Several Republican governors have already said they would not take the extra federal money to expand the program. Under the law, the federal government pays the full cost for those newly eligible for Medicaid from 2014 to 2016, then states have to begin to contribute to the cost but no more than 10 percent by 2020. States will receive their current federal funding match rate for people currently eligible. What has Mitt Romney proposed for Medicaid? Romney wants to overturn the health law and the Medicaid expansion. Instead, he proposes converting the program into a block grant to states -- a fixed annual allotment of money. Payments from the federal government would grow at 1 percentage point above inflation a year, which would slow funding, in exchange for fewer federal rules on how states can use the money. According to the Romney campaign, the block-grant approach will save an estimated $100 billion per year by 2016. Repealing the health care reform law would reduce Medicaid spending by $618 billion over the next 10 years, according to the Center on Budget and Policy Priorities and Romney's additional cuts would mean a total of at least $1.4 trillion in cuts over a decade. Such a cut would be even more than the plan for Medicaid that passed the U.S. House of Representatives, a bill that was authored by House budget chairman and vice presidential nominee Rep. Paul Ryan. The House plan to block grant Medicaid would curtail Medicaid spending by $810 billion over 10 years, according to the Congressional Budget Office. In 2022, federal Medicaid funding would be about 34 percent less than states would receive under current law, according to an analysis by the Center on Budget and Policy Priorities. Under Ryan's block grant proposal, between 14 million and 27 million fewer people would be covered in 2021 than under Medicaid as it currently exists, according to an Urban Institute analysis. With less money, states are certain to reduce benefits and ask recipients to pay more for care, among other changes. Which states have the most to gain under the Obama administration's Medicaid plans? Florida, Texas, Mississippi and other states that have traditionally had the tightest eligibility for Medicaid and a large percentage of uninsured citizens have the most to gain under the federal health law. But these states are among those saying they won't expand Medicaid because they don't think they'll have money to pay their share starting in 2017. They also worry that the health law would increase their Medicaid costs as people who were previously eligible but not enrolled would sign up. Under this scenario, the state would have to pay its share of the costs for these people because their eligibility does not result from the health law. States such as Vermont that already cover residents up to 133 percent of the federal poverty level in Medicaid would not gain much new funding. What would states do with more flexibility if, as Romney wants, Medicaid becomes a block grant? In tough economic times -- when Medicaid is most needed but when state revenues are squeezed -- states could be expected to tighten eligibility or reduce benefits. The Obama administration has given states the ability to cut optional Medicaid benefits such as vision and dental services and prescription drugs. But the administration has been reticent to allow states to shift higher costs on Medicaid recipients or force them to pay premiums or large-co pays for services. If the program turned into a block grant, states would likely have more freedom to shift higher costs onto recipients or make it harder for them to sign up. Are there enough doctors to handle 17 million more Medicaid recipients under the health care reform law? The safety net would feel some strain, though it still has a few years to get ready as not everyone would sign up immediately. Today, approximately 69 percent of doctors nationally accept new Medicaid patients, but the rate varies widely across the country, according to a study by the Centers for Disease Control and Prevention. New Jersey had the nation's lowest rate at 40 percent, while Wyoming had the highest, at 99 percent. To increase the number of providers the health law does two things: It spends $11 billion to expand community health centers, which provide primary care to millions of Medicaid recipients. The law also gives a pay raise to primary care physicians treating Medicaid patients. In 2013 and 2014, primary care physicians would be paid at Medicare rates, which equates to about a 30 percent average pay hike nationally. How much will it cost to add 17 million to Medicaid and how can the nation even afford it? The Medicaid expansion makes up a big chunk of the health law's $930 billion price tag over the next decade, according to the Congressional Budget Office. But the money won't increase the federal budget deficit because the law is being funded by new taxes and penalties. These include a new excise tax on high-premium insurance (Cadillac) plans, equal to 40 percent of premiums paid on plans costing more than $27,500 annually for a family, starting in 2018; an increase in Medicare payroll taxes on couples with income of more than $250,000 a year; and new fees on insurance companies, pharmaceutical companies and medical device manufacturers. Why can't states experiment with new health care delivery methods with Medicaid now? Actually, they can and they are. Dozens of states in recent years have hired private managed care firms such as Aetna or United Healthcare to cover millions of Medicaid recipients, and the trend is expected to continue regardless of who wins the election. States are also experimenting with such things as bundling payment to hospitals and doctors, establishing medical homes where doctors' offices are paid to coordinate patient care for those with chronic illnesses and forming accountable care organizations that allow providers to share in savings if they can meet certain quality measures. While the federal government has to approve state experiments, what often hinders their efforts is getting consensus from stakeholders such as nursing homes, hospitals, physicians and consumer advocates. Why should those who don't know anyone on Medicaid care about the candidates' positions? No one knows when they will lose their job and health benefits and have to rely on Medicaid for themselves or their children. While the program pays for 60 percent of nursing home residents, most of them only become eligible after depleting their savings to pay for the care. Most hospitals are also heavily reliant on Medicaid funds so their ability to remain financially healthy depends on the program. Medicaid is also an economic engine in most states as the money goes to doctors, device makers, durable medical equipment makers and others. Why is Medicaid such a hot issue this year? Medicaid costs have risen markedly in the past several years due largely to the economic downturn, and the program is in the crosshairs of Capitol Hill deficit hawks. At the state level, Medicaid is usually the first or second costliest program and many governors have been asking for more flexibility to rein in spending. Since 2009, when Congress gave states billions dollars of extra Medicaid funding in the federal stimulus law, the federal government has required states to maintain current eligibility levels. The provision was continued in the 2010 federal health law, though it expires in 2014. If you have additional questions about Medicaid and the candidates' proposals for the program, Phil Galewitz of Kaiser Health News will answer them in a live video chat on Wednesday, Oct. 3 at 1 p.m. Submit your questions in the comments section below, to onlinehealth@newshour.org or via Twitter @jasokane.